Doug Winter, a leading dealer and researcher in the field of U.S. gold coins, shared these thoughts in the foreword of Q. David Bowers’s latest reference, A Guide Book of Gold Eagle Coins, which is set to debut in December 2017. The completely unexpected result of this answer was a commission for me to put together a complete set of pre-1900 Liberty tens in the best value grades. My client would buy any coin which made sense to me and that I recommended. I was off to the races! The first show I attended with this want list was in June in Long Beach. I had taken a Red Book and the David W. Akers 1980 book on eagles and, after a good deal of study, created a “List of 50”—the dates and mintmarks I felt represented the best value. Naively, I expected to find five or six at the show—easy enough I thought—and was actually a little nervous about being able to pay for all the coins I was going to buy, especially if I found some of the rarities. In three days of looking at the coins on display and in boxes at the various dealer tables, I found exactly one coin on my list: a perfect EF 1871-CC eagle, which, if I recall correctly, I paid $1,500 for. For five years, every show I went to included a hunt of the List of 50. I think I found close to half of them before I got the dreaded call: My client was beginning his own practice and he needed to sell his growing collection in order to finance some needed medical machinery. Sadly, we consigned his eagles to an auction and I would have to wait a few more years before I would again handle many on the List of 50. He returned to me the very same answer I gave my client in La Jolla two decades earlier! I have had a long-standing love affair with the 10-dollar gold denomination. First comes the Capped Bust Right, Small Eagle type, issued from 1795 to 1797. In my opinion, the 1795 eagle is one of the all-time “trophy” coins; a classic issue that isn’t really rare from a standard supply sense, especially in grades such as Extremely Fine and About Uncirculated, but has been in constant demand since the earliest days of American gold coin collecting. This type is followed by the Capped Bust Right, Heraldic Eagle type, made from 1797 to 1804, including the two rare 1798 varieties and the magically dated 1804. Even after owning dozens of these big, beautiful coins, I still get a thrill buying one today, especially one dated in the 1790s. After a long hiatus comes the Liberty Head design, which is generally divided by the No Motto (1838–1866) and With Motto (1866–1907) types. The No Motto issues were made at the Philadelphia (1838–1865), New Orleans (1841–1860), and San Francisco (1854–1866) mints. Many of these issues have tiny original mintages and even tinier survival rates. The collector who demands perfect, frosty MS-65 and finer No Motto Liberty Head eagles is in for a rude surprise—they are essentially non-existent and a host of dates are either unknown or excessively rare in MS-60, let alone in higher grades. The With Motto issues were made at Philadelphia (1866–1907), Carson City (1870–1893), San Francisco (1866–1907), New Orleans (1879–1906), and Denver (1906–1907) mints. More of the With Motto dates exist in relatively higher grades due to hundreds of thousands of coins being shipped to overseas banks to pay trade debts. But there are some real rarities, including the unheralded 1875 circulation strike (mintage 100), an issue so rare that most collectors and dealers have never seen one, let alone owned one. Next comes the glorious Saint-Gaudens Indian Head struck from 1907 to 1933. In my humble opinion, this is the apex of United States coinage design. When you have seen a pristine gem rich with mint frost and delicately toned in rose and green-gold hues—it doesn’t get much better than that! 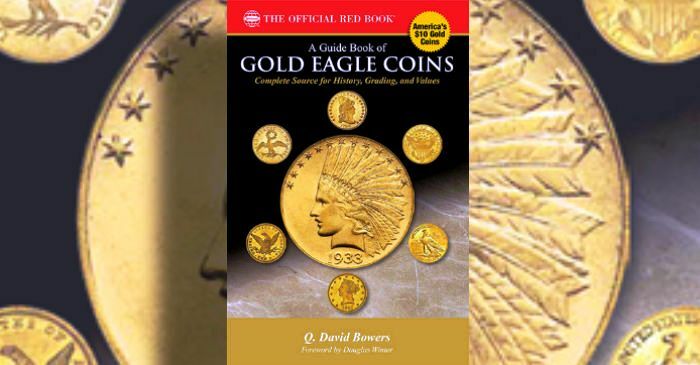 Dave Bowers is uniquely qualified to write the much-needed Guide Book of Gold Eagle Coins and I, for one, will be an avid user of his new book. I hope you will become as big a fan of this remarkable denomination as Dave and I are.